One of the wonders of technology is the ability to construct something out of metal, plastic or something else and make it replicate something from nature. 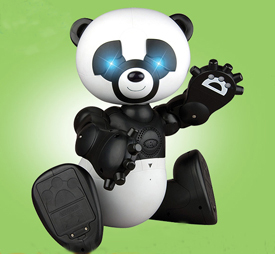 Technology has always portrayed so many things through nuts and bolts that it doesn’t surprise us anymore when a company liks WowWee creates a panda robot, aptly named "Robopanda". It might not be exactly the perfect robot companion for you but it is one of the most ingenious things that WowWee has ever created. 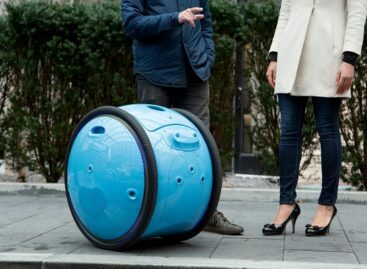 Some of the other products of this budding company include the Robosapien RS-2 which easily sells for $300. However, if you would like a similar toy robot for a much lower price, then the $169 Robopanda beats the RS-2 hands down. The Robopanda weighs roughly around 8 pounds and the toddler-sized robot toy wakes up whenever you turn it on. One of the endearing features of the Robopanda is that it is able to communicate in a childlike voice. Four AA and six C batteries are used to power this nifty robot. Even though it lacks visual sensors, the Robopanda is highly receptive to touch. There are numerous invisible touch sensors on its head, stomach, back, hands as well as feet. You’ll want to touch the Robopanda because of its feature of constantly asking you to do so. The body of the Robopanda is very animated as it can move its hands, feet and arms. One thing to note is that it is not built for crawling, so be very conscious of the position that you put your Robopanda in. This is one of the first WowWee robots that does not ship with a remote control. This is because you will never need it. The Robopanda knows so many phrases and words and also uses a constant stream of requests and comments. It also is able to tell stories and can respond to interaction. One of the questions that the Robopanda can ask is ask whether you have been ever attacked by a panda before. It follows it up with the question, "Do you want to be?" which says it in jest. The Robopanda is certainly one of the best things to happen in robotics because of the animated and interaction that happens. You will appreciate the design of the Robopanda as well as the interactivity that it offers. If you are a robot nut, then you’ll certainly love playing with this new creation from WowWee.